Summary (from Amazon): In the summer of 1974, a fourteen-year-old girl in Dolton, Illinois, had a dream. A dream to become an actress, like her idols Ron Howard and Vicki Lawrence. But it was a long way from the South Side of Chicago to Hollywood, and it didn't help that she'd recently dropped out of the school play, The Ugly Duckling. Or that the Hollywood casting director she wrote to replied that "professional training was required." But the funny thing is, it all came true. 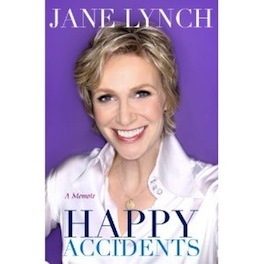 Through a series of Happy Accidents, Jane Lynch created an improbably--and hilarious--path to success. In those early years, despite her dreams, she was also consumed with anxiety, feeling out of place in both her body and her family. To deal with her worries about her sexuality, she escaped in positive ways--such as joining a high school chorus not unlike the one in Glee-but also found destructive outlets. She started drinking almost every night her freshman year of high school and developed a mean and judgmental streak that turned her into a real-life Sue Sylvester. Review: Ok, I stopped typing the summary of the book because it just gives away too much and it leaves me with nothing to put in my review and nothing for you to discover when you read the book yourself. Here are some of my thoughts about this book. I expected the book to be laugh out loud funny and parts of it were. However, there are even more poignant moments, interesting moments, and touching moments. The book is much fuller and introspective than I expected. That said, Jane Lynch is funny! She is self-depricating, witty, sarcastic, and just... funny! I found the last section of the book in which she meets her wife to be very moving and touching. This does not read like a Hollywood tell-all book, which made me so pleased. It read easily and quickly and I feel like I learned about a person's life and personality rather than an industry. The story is really about how Jane Lynch figured out herself, her business, and what's important to her along the way. Click to see my updated Google Map. Jane moved a lot. She grew up in Dolton, Illinois, and lived in Chicago, Los Angeles, New York, visited Florida, Paris, Vancouver and various other locations. So, no one geography connection for this book.